The Conductivity Probe can be used to measure either solution conductivity or total ion concentration of aqueous samples being investigated in the field or in the laboratory. Conductivity is one of the most common environmental tests of aquatic samples. Even though it does not tell you specific ions that are present, it quickly determines the total concentration of ions in a sample. The Conductivity Probe may require a compatible interface and software. Choose a platform below to see compatible interface and software options. The Conductivity Probe is fully supported with LabQuest 2 (version 2.8.5), a standalone data logger with built-in graphing and analysis software. Set the range switch on the sensor. When you are finished making measurements, rinse the electrode with distilled water. Store dry. For many experiments, calibrating the Conductivity Probe is not required. A calibration equation is stored on each probe before they are shipped, which is used as a default by Vernier software. For the most accurate measurements with this sensor, we recommend calibration. It is a simple process that takes only a few minutes. When you have finished using the Conductivity Probe, simply rinse it off with distilled water and blot it dry using a paper towel or lab wipe. The probe can then be stored dry. If the probe cell surface is contaminated, soak it in water with a mild detergent for 15 minutes. Then soak it in a dilute acid solution (0.1 M hydrochloric acid or 0.5 M acetic acid works well) for another 15 minutes. Then rinse it well with distilled water. Important: Avoid scratching the inside electrode surfaces of the elongated cell. Important: Do not place the electrode in viscous, organic liquids, such as heavy oils, glycerin (glycerol), or ethylene glycol. Do not place the probe in acetone or other organic solvents, such as pentane or hexane. The Vernier Conductivity Probe measures the ability of a solution to conduct an electric current between two electrodes. In solution, the current flows by ion transport. Therefore, an increasing concentration of ions in the solution will result in higher conductivity values. The Conductivity Probe is actually measuring conductance, defined as the reciprocal of resistance. When resistance is measured in ohms, conductance is measured using the SI unit, siemens (formerly known as a mho). Since the siemens is a very large unit, aqueous samples are commonly measured in microsiemens, or µS. where d is the distance between the two electrodes, and A is the area of the electrode surface. A potential difference is applied to the two probe electrodes in the Conductivity Probe. The resulting current is proportional to the conductivity of the solution. This current is converted into a voltage. Alternating current is supplied to prevent the complete ion migration to the two electrodes. Each cycle of the alternating current, the polarity of the electrodes is reversed, which in turn reverses the direction of ion flow. This very important feature of the Conductivity Probe prevents most electrolysis and polarization from occurring at the electrodes. Thus, the solutions that are being measured for conductivity are not fouled. It also greatly reduces redox products from forming on the relatively inert graphite electrodes. The Vernier Conductivity Probe is automatically temperature compensated between temperatures of 5 and 35°C. Note that the temperature of a solution is being read by a thermistor that extends into the space between the graphite electrodes. Readings are automatically referenced to a conductivity value at 25°C; therefore, the Conductivity Probe will give the same conductivity reading in a solution that is at 15°C as it would if the same solution were warmed to 25°C. This means you can calibrate your probe in the lab, and then use these stored calibrations to take readings in colder (or warmer) water in a lake or stream. If the probe was not temperature compensated, you would notice a change in the conductivity reading as temperature changed, even though the actual ion concentration did not change. Blot the inside and outside of the electrode cell dry to avoid water droplets diluting or contaminating the sample to be tested. 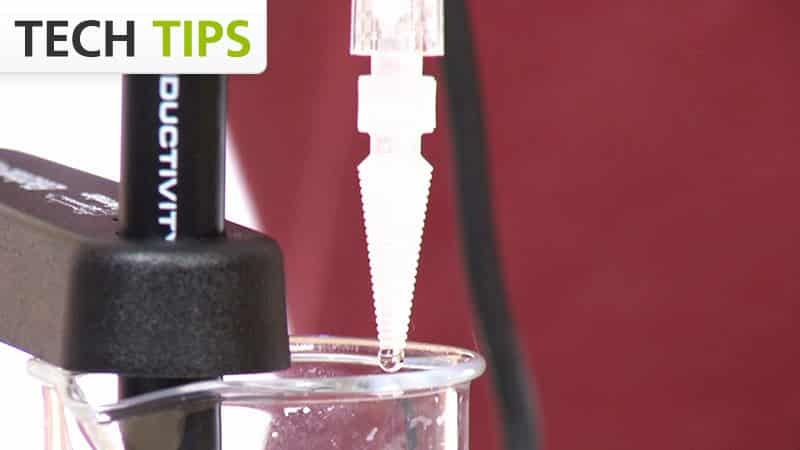 Be sure the electrode surfaces in the elongated cell are completely submerged in the liquid and that there are no bubbles around the electrode surface. Gently swirl the probe, or stir the solution with a stirring bar and stir plate, during data collection. Do not completely submerge the sensor. The handle is not waterproof. If you are taking readings at temperatures below 15°C or above 30°C, allow more time for the temperature compensation to adjust and provide a stable conductivity reading. If the probe cell surface is contaminated, soak it in water with a mild detergent for 15 minutes. Then soak it in a dilute acid solution (0.1 M hydrochloric acid or 0.5 M acetic acid works well) for another 15 minutes. Then rinse it well with distilled water and blot dry. Important: Avoid scratching the inside electrode surfaces of the elongated cell. It is best to sample away from shore and below the water surface, if possible. In free-flowing streams, there will usually be good mixing of the water, so that samples taken near the current will be quite representative of the stream as a whole. If you are sampling an impounded stream or a lake, there will be very little mixing; therefore, it is important to sample away from shore and at different depths, if possible. Do not drop the Vernier Conductivity Probe so that the entire electrode is submerged. The electrode is not constructed to withstand higher pressures, so seepage into electronic components of the electrode will result. Although it is better to take readings at the collection site, readings of total dissolved solids or conductivity should not change significantly if you collect samples and take readings at a later time. However, be sure that samples are capped to prevent evaporation. If sample bottles are filled brim full, then a gas such as carbon dioxide, which is capable of forming ionic species in solution, is prevented from dissolving in the water sample. Since the probe has built-in temperature compensation, you can do your calibration in the lab. This means that even though you will be sampling in water that has a different temperature than your calibration temperature, the probe will take correct readings at the new sampling temperature. Salinity is the total of all non-carbonate salts dissolved in water, usually expressed in parts per thousand (1 ppt = 1000 mg/L). Unlike chloride (Cl-) concentration, you can think of salinity as a measure of the total salt concentration, comprised mostly of Na+ and Cl- ions. Even though there are smaller quantities of other ions in seawater (e.g., K+, Mg2+, or SO42-), sodium and chloride ions represent about 91 percent of all seawater ions. Salinity is an important measurement in seawater or in estuaries where freshwater from rivers and streams mixes with salty ocean water. The salinity level in seawater is fairly constant, at about 35 ppt (35,000 mg/L), while brackish estuaries may have salinity levels between 1 and 10 ppt. The salinity range of the Conductivity Probe is 0 to 10 ppt. Seawater has a salinity of 35 ppt, so any seawater samples will need to be diluted before making measurements with this sensor. We recommend that you dilute seawater samples (or other samples that initially give readings above 10 ppt) to 1/4 of their original concentration, then multiply their measured salinity reading by 4 to obtain a final salinity value, in ppt. Brackish water in coastal estuaries is often in the range of 0 to 10 ppt, well within the high range of the probe. Note: Vernier also sells a Salinity Sensor (order code SAL-BTA) with a range of 0 to 50 ppt. A low standard (5 ppt salinity), add 4.60 g of NaCl to enough distilled water to prepare 1 liter of solution. A high standard (10 ppt salinity), add 9.20 g of NaCl to enough distilled water to prepare 1 liter of solution. Because there is a nearly linear relationship between conductivity and concentration of a specific ion or salt, the Conductivity Probe can be used to determine the concentration of an ion. A curve can be obtained if you prepare or purchase standard solutions. Note in this figure the 2:1 ratio between conductivity in µS/cm and TDS concentration in mg/L. Even though total dissolved solids is often defined in terms of this 2:1 ratio, it should be understood that a TDS reading of 500 mg/L can have a different meaning in a sample that is mostly NaCl than in another sample that is composed primarily of hard water ions such as Ca2+ and HCO3-. The relationship between conductivity and sodium chloride concentration is approximately a 2:1 ratio and is very nearly a direct relationship. The table shows the relationship for sodium chloride concentration in mg/L to TDS to conductivity. If you have watched the related product video(s), followed the troubleshooting steps, and are still having trouble with your Conductivity Probe, contact Vernier Technical Support at support@vernier.com or call 888-837-6437. Support specialists will work with you to determine if the unit needs to be sent in for repair. At that time, a Return Merchandise Authorization (RMA) number will be issued and instructions will be communicated on how to return the unit for repair.